Dr. Antal Geber [1879-1962], Budapest, Hungary, by 1924; gift 1946 to Mr. and Mrs. Anthony Geber, Chevy Chase, Maryland; gift 1989 to NGA. Budapest Collectors' Medal and Plaquette Exhibit, Budapest Museum of Fine Arts, 1924, no. 2458 (cat. by K. Csánsyi). Ausstellung Alter Kirchlicher Kunst, Iparmüvészeti Muzeum, Budapest, 1930, no. 145, pl. 19. A Collector's Cabinet, National Gallery of Art, Washington, D.C., 1998, no. 99, as Pietà, after El German, German (possibly Augsburg). Aggházy, Mária. "Pietà; Egy barokk motivumvándorlás kerdése," Regnum 6 (1947): 3-13, esp. 5-6, no. II.3, 8, fig. 9. Weber, Ingrid. Deutsche, Niederländische und Französische Renaissanceplaketten 1500-1650. Munich, 1975: 1:232-233, no. 452, note. Geber, Anthony. "Name Inscriptions: Solution or Problem?." In Italian Plaquettes. Ed. by Alison Luchs. Studies in the History of Art 22 (1989): 254-259, fig. 12. Zanuso, Susanna. 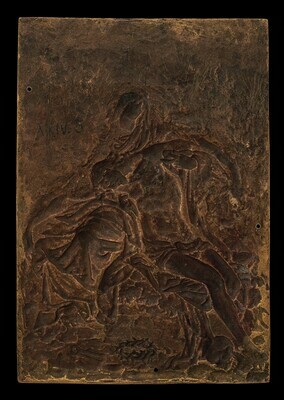 "Scuola italiana del XVI secolo, Pietà." In Di Lorenzo, Andrea, and Frangi, Francesco, eds. 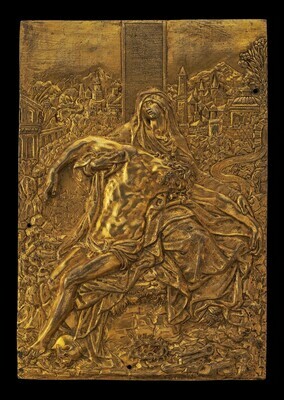 La raccolta Mario Scaglia: Dipinti e sculture, medaglie e placchette da Pisanello a Ceruti. Exh. cat. Museo Poldi Pezzoli, Milan, 2007: 130.